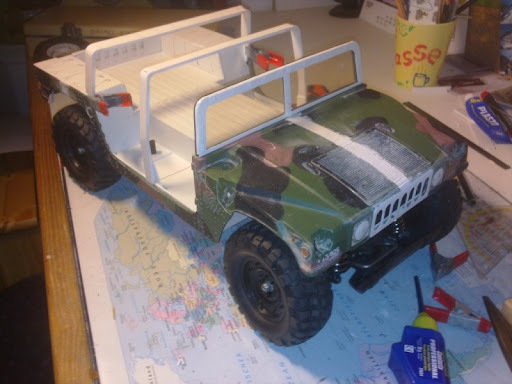 as I haven't seen a Hummer in a long time, I thougt I could show you mine. I started to customize it about 9 years ago. Than it was sitting on my shelf or (seldomly) running in the wild. Then I decided to change the body. I wanted it to look more civilian, so I decided to build a Station Wagon with a widebody-kit (since the TA-01 chassis is weirdly wide...). I also had to change the front suspension since under load the wheel moved too far back. So I glued a brass tube into the lower wishbone joint and now the wheel goes straight up. It sill allows for a great axle-movement. Last edited by espchristian : 04-14-2019 at 08:25 AM. Last edited by espchristian : 04-14-2019 at 08:19 AM.